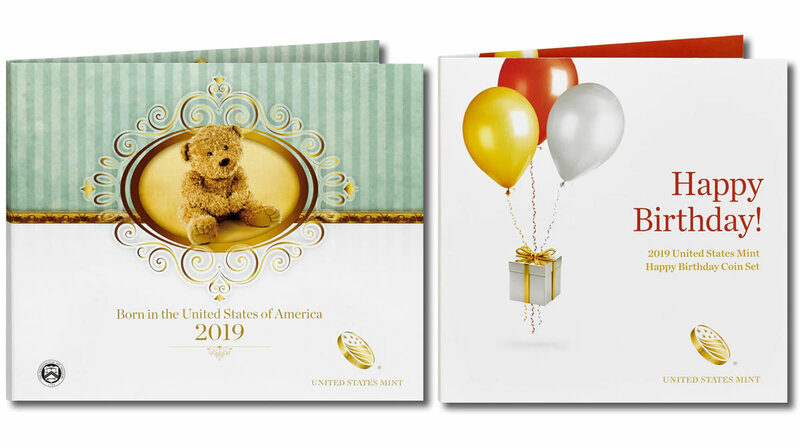 Two gift sets for 2019 made their first appearance on the U.S. Mint’s weekly sales report. Designed for newborns and birthdays, both sets launched last Thursday, Jan. 3. 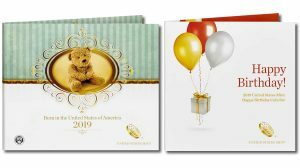 The 2019 Birth Set opened with sales of 2,332 compared to 2,426 for last year’s set and the 2019 Happy Birthday Coin Set debuted with sales of 2,541 against 2,423 for the one from 2018. That said, such comparisons are mostly irrelevant given that special occasions are their sales driver and those happen throughout the year. The two sets ranked second and third on the list of top weekly sellers. Make it four weeks in a row for the 2018-S Proof American Innovation Dollar. It’s led numismatic sales for the United States Mint since its Dec. 14 release. The proof dollar from San Francisco surged 38,249 for a new total of 117,972. Rolls of Philadelphia and Denver-minted American Innovation dollars were also popular (again), ranking eighth and ninth. Bags of them came in thirteenth and fourteenth. Combined, collectors in 24 days have ordered 658,733 Innovation dollars. The Mint’s five products with them have now brought nearly $1.7 million. In its latest report, the U.S. Mint published sales data for 165 numismatic products. Forty-three products outperformed their prior weekly gains against 80 previously. Not counting the new sets so as to compare apples-to-apples, 7 products increased by more than 1,000 units against 6 in the previous report. In addition, 7 products saw their sales reduced compared to 1 previously. All the reductions were modest at either 1 unit or 2 units. Below are tables showing the latest sales for U.S. Mint numismatic products. The sales period covers from Dec. 31 to Jan. 6. Products with an asterisk (*) are no longer available or had no reported sales. Anyone catch that the 2018-S Silver Proof Eagle is listed as unavailable on the US mints website but still available as part of the limited edition set?